In this article, Herb Titus explains the legal proposition that the First Amendment prevents the government from forcing individuals to promote a message with which they do not agree. Herb Titus was quoted in World Net Daily Article on California law which seeks to order faith-based organizations to refer women to abortionists. Bob Unruh covers our Luis brief opposing federal asset seizure prior to trial, explaining how it strips defendants of the right to engage counsel of choice. Herb Titus quoted in article about limits imposed on California by First Amendment. Pat McGuigan, Publisher, The City Sentinel, referenced Herb Titus’ writings on restitution. 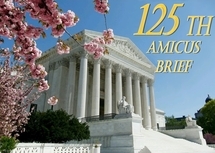 Charisma News reports on our Supreme Court brief on Traditional Marriage. Bob Unruh discusses our Supreme Court brief supporting traditional marriage. Richard Winger’s Ballot Access News covered our petition for certiorari filed in the U.S. Supreme Court on behalf of John Albert Dummer, Jr. and Edward C. Noonan. Mark Fitzgibbons article: “Lazy, Incompetent Bureaucrats Will Celebrate the Heien Decision for Years”. Today, in an article in The Wall Street Journal entitled “A Monetary Gadfly in an Age of Fiat Money,” Seth Lipsky discusses the amicus briefs we filed for GATA in the government’s case against Bernard vonNotHaus.